Pleasant and sociable while alert and confident, the American English Coonhound is a highly active family pet. 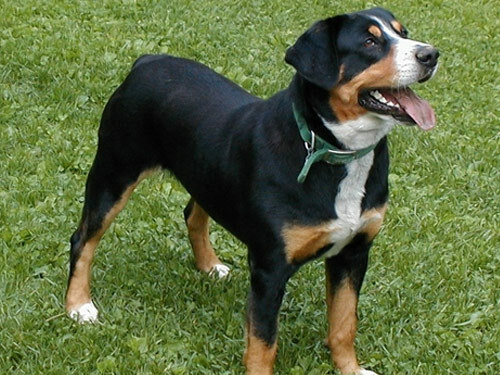 Though they are an active hound dog, the breed is excellent for homes with children and other pets. They are passionate working dogs and excellent guardians, but they require a firm and confident training hand. This is not a quiet breed, enjoying the sound of its own bark. They will bark at visitors and "bawl" when they have spotted something they consider to be prey. If you have neighbors easily offended by noise or live in an apartment or condominium, this may not be the breed for you. The American English Coonhound is a high energy breed requiring lots of physical and mental stimulation. Frequent walks and jogs, playtime with children and lots of space are necessary to keep this breed from becoming destructive to themselves and personal property. They should be carefully trained as they have a tendency to take off in chase after what they consider to be prey: squirrels, rabbits, and other animals, and may be difficult to regain control of once out of reach. There are few other upkeep concerns as grooming is not regularly necessary and there are few notable health concerns. The most commonly noted health concern among American English Coonhounds is hip dysplasia, a condition in which the hip socket is abnormally formed. This may cause arthritis in the hips, difficulty walking, and a symptom known as the "bunny hop" as the dog attempts to reduce the amount of movement required by the hips. In addition, hip dysplasia can cause spine and knee injury. It can often be seen by the time a dog is 18 months old and is treatable with anti-inflammatories, nutritional supplements such as glucosamine, and surgery in extreme cases. Descended from the English Foxhound, the American English Coonhound was developed from the Virginia Hound for rougher terrain. Used by day to hunt fox and by night to hunt raccoon, the breed we see today is a wide-ranging hunter with amazing speed and notable voice. These dogs are known for their speed, endurance, intelligence, athleticism and love of the hunt both out in the forest and in the backyard.